The ad that ran in Backwoods Home back in the mid-1990s began, “WANTED: Someone to go back in time with. This is not a joke.” And while screenwriter Derek Connolly and director have fashioned their new film inspired by that classified, Safety Not Guaranteed, as a comedy, they don’t treat it as a joke. 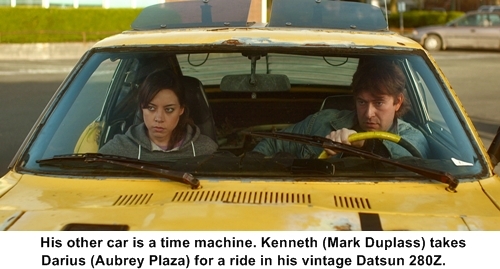 Instead, they find a lot of heart in this tale of lonely stock clerk and possibly mad, possibly genius Kenneth (the suddenly ubiquitous Mark Duplass) whose invitation to time travel draws downbeat Seattle Magazine intern Darius (Aubrey Plaza), her nerdy colleague Arnau (Karan Soni), and oily journalist Jeff (Jake M. Johnson) into his story, an unexpectedly life-altering experience for all four of them. A San Francisco Bay Area native who now lives in Vermont, Trevorrow recently returned to his former home turf to talk Safety in advance of the Sundance Film Festival hit’s theatrical release. Q: You and Derek Connolly are writing partners. When he brought you this, how far along in the story had he gotten and were you involved with the writing at all? A: He came to me with the script, with a draft that we then developed for a while. Derek did all of the actual writing and I think part of the job of a director is to mold the story and build a narrative that’s going to work on screen. That’s what I did, but I respect Derek’s abilities so much and I respected his voice in this so much that I really wanted to make sure that every word was his. He also gave me the gift of being able to direct this film. So we just decided, “OK, we’re both going to be producers and I’ll direct and you’ll be the writer.” It really was a collaboration, not only that part, but on set he was next to me the entire time and I would confer with him daily, even moment to moment. “What would Kenneth say here? What feels honest in this moment? What feels true?” I’m very proud of our collaboration on this movie. It’s very organic. Q: You juggle a number of genres in the movie. Was that part of it from the start or was that something evolved as the script evolved? A: The first draft of the script was very much a comedy, mystery, road trip movie. What we really fleshed out of it was the romantic side of it, the love story and issues of emotional time travel and how – right now, Facebook is our time machine in a lot of ways, being able to go back and find people from your past that you otherwise wouldn’t have seen. We took that, but the question of the movie was always the same, “Is this guy crazy or not?” Even though we were going to turn it into a bit more of a love story, we didn’t want to turn it into a romantic comedy where the question is, “Are these two going to end up together?” We wanted to keep the question the sci-fi question and yet still have it supported by a love story. I think in the end it makes for a movie – I don’t know if it’s tonally erratic, but there are a lot of different tones that are coming into play. For me, the big challenge was juggling all these tones and making sure that everything, like a funnel, came down to that last moment where ideally a lot of these various questions you have are going to be answered in a single sequence.